Our 3rd Annual Peer Soccer Trip Is A Wrap! Learned What it Means to be a Global Citizen! It’s Not Too Early to Apply for 2019! You know girls have the power to make positive change in the world because you’re one of those girls. Over 9 days, you will change the lives of some truly amazing young girls, and they will change yours. Pack your adventurous spirit and get ready to be a coach, a team member, a mentor, friend, student and explorer. Get pumped to work hard and laugh harder. To smile and be transformed. Watch “THIS IS ME” a 3-minute fun and motivating video on play! You’ll learn why our peer soccer program is so IMPORTANT!
" As a college level soccer player I wanted to share my passion for the sport of soccer, however, I never imagined how much this experience would impact my understanding of both vulnerability and resilience. The trip changed my life and I was honored to returned as the 2018 team coach! 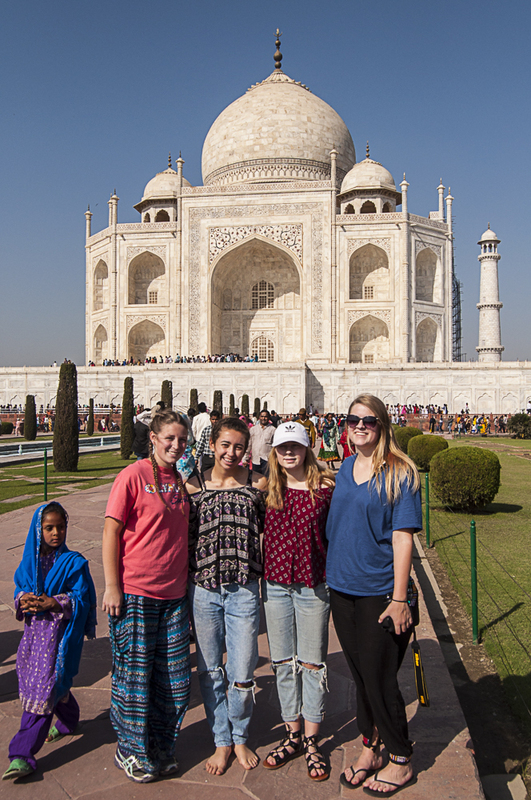 We invite you to join us for nine days in India. Nine days that will change the lives of vulnerable young girls and nine days that will change you…for a lifetime. We invite you to travel, to teach, to learn. As part of our 3rd annual Peer Sports & Play Program, you will teach young girls from the slums and orphanages the basics of soccer. Learn about India and its culture. Make new friends. And change lives forever. You will be guided by professionals with over 20 years of experience in international humanitarian aid programs. We will be there every step of the way to make sure that you are ready. From passport and visa assistance, to support with fundraising, to cultural sensitivity and awareness, all of us at Limitless Child will work closely with you to ensure that you are equipped with everything necessary to ensure a safe, healthy, and exciting trip. And like it or not, you will be chaperoned 24/7 by Limitless Child staff members and parent volunteers during your time abroad! 3 years ago I traveled with Limitless Child for the first time. I had never been out of the country or been a coach, so I was a bit nervous. But the trip was so meaningful that I knew I had to return and I have every year. I have made, what I hope, are life-long friendships with girls whose lives may look nothing like my own, but who share the same dreams and goals that me and my friends at home share. India and the ASHA girls are a part of my life and I can’t wait to go back next year! days 4 thru 7 | soccer clinics, 1 or 2 sessions each day), A.M. sessions, rest, meals, exploration of pune, shopping, educational visits (including a women's empowerment organization, a before and after-school program for vulnerable girls, a local orphanage, and religious temples), P.M. sessions for the older girls. A highlight will be a celebration banquet for all participants. day 8 | morning soccer session, afternoon flight from pune to delhi, the incredible capitol city of India! day 9 | visit SOS children’s orphanage, shopping at the famous Dilli Hat Handicraft Market, dinner, travel meeting, flight home! Space is limited to only 8 participants, so apply early. The Application is available online (see the link below) and needs to be submitted no later than September 15, 2018. To help pay for the trip, we can supply you with fundraising materials and ideas. Last year the girls raised the full cost of their trip in only 6 weeks! The trip costs $2,000 plus travel related expenses including the following. A non-refundable deposit of $500 is due by early October, 2019. The non-refundable balance is due early November. A valid U.S. passport is required (to be considered valid, the passport must not expire prior to June 1, 2020). If you do not have a passport, please apply as soon as possible. Program and travel manuals will be provided at the informational meetings. Limitless Child International will book your airfare and assist you with obtaining an India travel visa. The quick and easy way to apply! Use this link to download the application. Use this form to help you fundraise "door-to-door". Information for your sponsors who donate more than $50. Use this if you would like to download the brochure. A helpful tool in helping you plan your trip.